Sheri Johnson, County Health Rankings Acting Director, said in a phone call with Journalist’s Resource that they focused on housing to help people understand that health is influenced by many variables, including the physical environment and social and economic factors. “Where we live makes a difference in how well and how long we live,” she said. The rankings, which reflect the relative health of counties within a state, are generated from the comprehensive analysis of more than 30 health-related measures within datasets collected through over a dozen regular, large-scale efforts, including reports from the Centers for Disease Control and Prevention, the National Center for Health Statistics, the Behavioral Risk Factor Surveillance System and the American Community Survey. 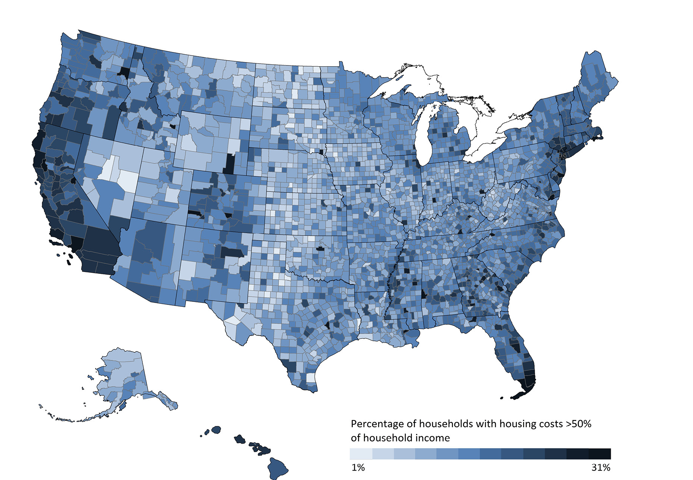 The findings highlight relationships between variables like housing cost burden (the percentage of households that spend over 30 percent of income on housing) and health status, diet and demographic information within counties. The rankings are accessible through an online tool that is searchable by state and county. The tool compares health outcomes and health factors across a state’s counties. Givens suggested that the rankings are a useful tool for journalists, too. “Our annual reporting offers a wonderful place for journalists to explore,” she said, adding that journalists can use the rankings to learn more about the health of their communities. Johnson said that the rankings offer an opportunity for journalists to highlight structural factors, such as social and economic factors, that affect who has the opportunity to own a home, and who might have experienced discrimination or obstacles to home ownership. Givens also noted that journalists can act “as really important change makers themselves in this journey.” Their coverage of housing and health can play a “critical role in helping to motivate and call attention to what’s needed, and also to celebrate what’s going well,” she said. Further, the program’s searchable “What Works for Health” tool can help journalists discover solutions that have worked to reduce disparities and learn about communities that have served as exemplars for expanding access to affordable housing.